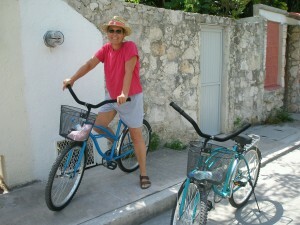 Having visited various parts of Mexico many times, we decided to move to Playa del Carmen July, 2007. We found a little two-story house with front and back gardens, two bedrooms (one for a painting studio), and one and a half bathrooms that was within walking distance of almost everything in town. The rent was right, so we met with a lawyer and the landlady to sign pages and pages of legal documents which listed every tablespoon and shot glass in the furnished house. The furnishings were minimal, so we spent weeks finding things we wanted to live with. We found the perfect three piece living room set, but waited a day and came back to find it sold! Another set was available, which we bought, but it has proved to be the most uncomfortable furniture ever created.We also bought bicycles right after we arrived: thick tires, foot brakes, front baskets; and have loved them dearly. We had studied Spanish in the US and I enrolled in a language school for a couple months. My fellow students were for the most part young people from Europe who already spoke several languages and after a while I felt like I had been left in the dust. My decision to leave school was a good one as it forced me to get out and talk. I have recently begun lessons again to straighten out some of my bad habits. I started painting with oils before I left Philadelphia, realizing that the world of craft fairs where I had sold my ceramic work for 30 years was over for me. I gave away my equipment to young artists, gessoed a ream of water color paper and came to Mexico. Since arriving I have discovered a decent shop for supplies in town and a huge shop in Cancun, which is only an hour bus trip away. Carolina, the 16 year old girl who lives next door, agreed to speak Spanish with me while I taught her to paint. We have throughly enjoyed each others company and learned much. Her parents invited us for coffee on a Saturday afternoon during which we spent two hours attempting to communicate in Spanish. The outcome has been that Jim joins them most Saturday mornings for their son’s soccer games. We have adopted a dog, Freddie, an 8 year old Cocker Spaniel, half blind, who loves to dig up the garden. Jim got involved with the Peanut Pet Shelter here in town where homeless dogs are rescued. Saturday afternoons they open the shelter for volunteers to help wash puppies and dogs (often 40 to 50 animals). Freddie has given Jim’s life purpose: up at 6:30 am for long walks, hours of replanting the garden after his digging adventures, showers together in the front garden, and hours of simple blind devotion on both of their parts. I am doing yoga two days a week and Tai Chi on Saturdays. My teacher is inspired and consequently I have throughly enjoyed becoming more physically fit and relaxed. Between this organized exercise and bike riding I now have muscles I never knew existed. At least once a week we ride our bikes a couple miles north of town where the beach is not yet developed to walk and swim for several hours. Our complexions have bronzed so that almost every color of clothing looks handsome. A couple years ago our next door neighbors invited us for their family celebration on Christmas Eve and we mentioned that we were thinking of moving as our landlady was not being especially responsive. The next day they came knocking on our door asking if we would consider renting their house as they were thinking of moving across the highway to a larger place for their 3 teenage kids. We replied “yes, in an instant” and when our lease was up we bought a case of beer and our friends helped move us next door. The family had lived in the house for 18 years and cared for it with love. They had built an extension to make the living room larger and in doing so extended the bedroom above to match so that I now have a studio which is twice the size of my original. Big enough for multiple canvases in process and an occasional class of painting students. In 2010 I began the KKIS Project (Keeping Kids in School) as one of the founding directors. The organization is now a recognized non-profit in Mexico and has tax exempt status in the US too. We raise money during the year to buy school supplies for children of Playa del Carmen whose families need a little help. Starting in a park in a working class neighborhood we took applications and returned a couple weeks later with backpacks filled with everything a child would need for one year of school. The first year we helped about 200 kids, the third about 600 and this past year, the fifth, we helped 3,000 students. This has taken a lot of dealing with government officials and agencies and lots of patience. But the smiles on those kids faces when they open their bag of supplies and see shiny new colored pencils is worth it all. A few years ago KKIS also began providing public high school scholarships for deserving students as this education is not free in Mexico and in 2018 there are 80 KKIS scholars. January 2018 I left the KKIS Project and started my own project, Leyendo (Reading in Spanish), to provide libraries for public schools in Playa del Carmen. Several of the Directors at the schools KKIS has helped asked for this assistance so I partnered with Sultan Akif from the Canadian non-profit Library in a Week. Together we cleaned, painted and built shelves in three existing school rooms. I was responsible for gathering the books and approached several private schools in town to make appeals and have been greatly rewarded with bags and bags of slightly used books in both English and Spanish. I also ran several fundraising concerts in my home to raise funds for new books. Now I am going forward with this dream on my own. I hope to attract people who are visiting Mexico who would like to participate both physically and financially in a service project. So another chapter in my Mexican adventure has begun!